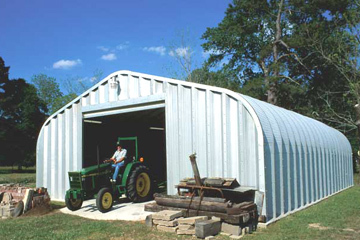 U.S. Buildings offers the perfect solution to your farm’s storage needs with our metal building kits. You need to protect your investment in hard-earned farming equipment, cattle, livestock, crops and commodities, and we offer customizable farm buildings and self-storage solutions to do just that, on any size farm. U.S. Buildings metal building kits can be used in a multitude of ways. Our clear-span, steel buildings can be used as a tough and sturdy storage unit for farm equipment, as a farm building, storage shed, barn or grain storage building. Many of our customers use our agricultural steel building kits simply as an extra storage space outside of a traditional barn, or as an alternative to a pole barn. Our buildings are easy to construct and you can be fully confident that our heavy gauge, galvalume construction will safely protect your assets. Whatever your agricultural building needs may be, our versatile buildings are the most durable and economic solution on the market today.